The rulers of country music change more often than your shirt. From Carrie Underwood to Keith Urban to George Strait to Johnny Cash. Here's why Kane Brown is the next king of country music. For those of you who don't know, Kane Brown is a country music singer who recently arrived on the scene as of 2014 when he began posting covers of songs, and he has been soaring ever since. He's going to be the next big country music king and here's why. Everyone loves the fairy tale romance. Johnny had June. Keith has Nicole. And Kane has Katelyn Jae. The two wed in 2018, but have been together since 2015 upon meeting through mutual friends. Both are singers who talk of potential collaborations on future works. All it takes is a look at a few of their many photos together to see the sparks flying. These two are clearly the next #couplegoals. Let's be honest, as politically incorrect as it is nowadays, being good looking is still an important part of a public image for many people... and Kane has the cute, sweet, and funny down to perfection. Just look at him and watch a few of his music videos... you'll be heading down the YouTube rabbit hole in no time. Celebrities with friends in the industry tend to help lift each other's careers. Kane Brown and friend Lauren Alaina are no different. Upon releasing their song "What Ifs" in 2016, both stars soared. But it wasn't their first time collaborating, as the two have known each other since they were teenagers in Georgia singing together at choir practice. Kane can do soulful and beautiful music like 2017's hit "Heaven." "I don't know how heaven could be better than this" is certainly true for fans who instantly fell in love with his voice and amazing lyrics. Because who doesn't want to find their heaven? "Heaven" topped the US Country Airplay (Billboard) chart and the Canada Country (Billboard) chart, as well as coming in at number two on the US Hot Country Songs (Billboard) list during its weekly release, maintaining those positions in the US for the 2018 year-end chart. However, Kane isn't going to be cornered into one category. His new album, Experiment, from 2018 contains more of his soulful music, but also shows his vast musical ability with poppy hits like "Short Skirt Weather" and his politically harsh "American Bad Dream." With his ability to transition between multiple musical genres, Kane's fans flock to his concerts to see his flashy shows, and hear his vocals in real life (which are just as good as on tracks). Having seen him in concert three times so far (most recently in February 2019 for my birthday), I can say that his concerts are definitely worth the money. He plays many of his well-known songs and engages the audience throughout. Grab tickets for more of his shows at Ticketmaster. Some country concerts can be too much for young children, with swearing, drinking, and drugs, but Kane's concerts and his kind heart are good for fans of all ages. His songs do have some references to more adult themes, but what music doesn't at this point? 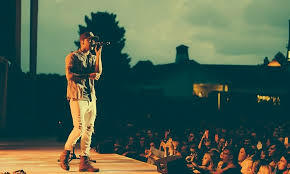 Starting with his hit, "Used to Love You Sober" in 2015, Kane has been consistently putting out new music for his fans and has seen his followers grow as his career does. Starting out slow doesn't discourage him from doing what he loves most: Making music. From covering other musician's songs to selling out concert venues with his own music, Kane has struggled through the fickle music industry and deserves his chance for the top spot. Kane shares his life and work with his 1.7 million followers on Instagram and Facebook, letting fans get a glimpse behind the glamour of country music life. While some performers are afraid of social media and others only use it for career boosts, Kane genuinely lets his fans into his life away from the cameras, microphones, and awards. Kane Brown doesn't only use his fame to help himself, but to try to effect racial change after speaking out in 2018 about how he has sometimes been turned away because of his heritage. He also released his song "American Bad Dream" in 2018 to show how he feels about the world around us and has had to continually defend it, as it is one of his most controversial songs released to date. Kane Brown has it all! He deserves his chance at the top of the country music hierarchy after all his hard work and amazing abilities. Curious adventurer. Crazed reader. Archery fanatic. Librarian in Training. Amateur author. Spice Up Your Life - The Spice Girls Are Officially Reforming!